Is It Madness. 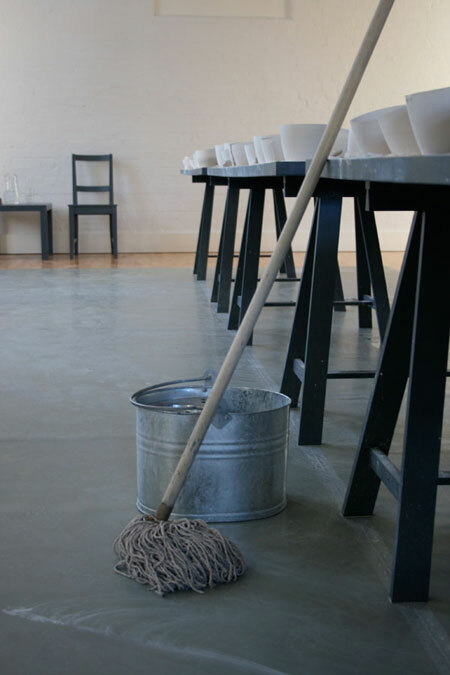 Is It Beauty was a work commissioned for the Siobhan Davies Studios that communicated ideas about the futility of human action. 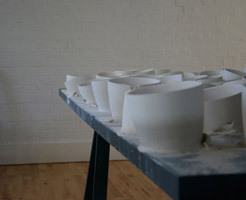 The artist responded to the repetitive actions of dancers in The Score, and conceived a performance piece that involved the continual filling and re-filling of a number of unfired ceramic bowls with water; however, as the bowls were unfired they collapsed, visually emphasising the human endeavour and desire to achieve. 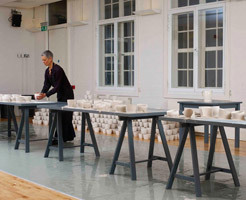 In autumn 2010 Siobhan Davies Dance presented ROTOR, an ensemble of performances, sound, installations and artworks that filled Siobhan Davies Studios. 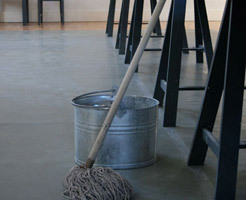 Davies extended her connections with other disciplines and commissioned nine artists to make, in their own art form, work based on ideas generated by dance and choreography. Is it madness. Is it beauty. 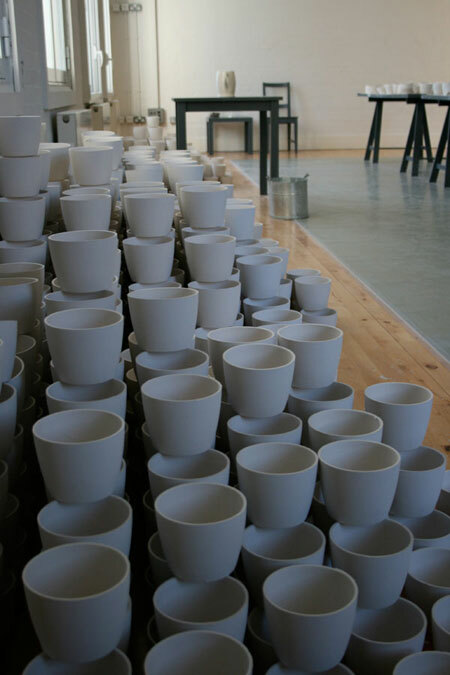 by Clare Twomey was a clay work that responded to the repetitive human actions encapsulated in The Score; futile actions of hope continued, unrelenting, despite their impending devastation in her new work. In the last five years Siobhan Davies has taken a conscious decision to move her work as a choreographer into a physical space that the dancers share with the audience. At the same time she has continued to work with artists from other disciplines, exploring what is at the periphery of individual and disciplinary practice, while maintaining the centrality of her position in choreography and dance. 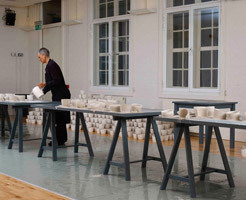 In 2009 the exhibition The Collection at London’s Victoria Miro Gallery, which involved the work of 17 artists, saw Siobhan Davies’ Minutes take sculptural form in the gallery space alongside the work of visual artist Anri Sala (A Solo in the Doldrums). Now ROTOR is the work of ten artists from different disciplines and four dance artists, focused on Siobhan Davies’ aim of positioning dance as a generator of ideas. The various artists’ work responds to the same starting point, a choreographic idea in the form of a visual score, but each does so independently, in a way that is distinct from the score, rather than being collaborative in the production of a single work. Intrinsic to this process is the lack of prescription, the openness of the invitation. 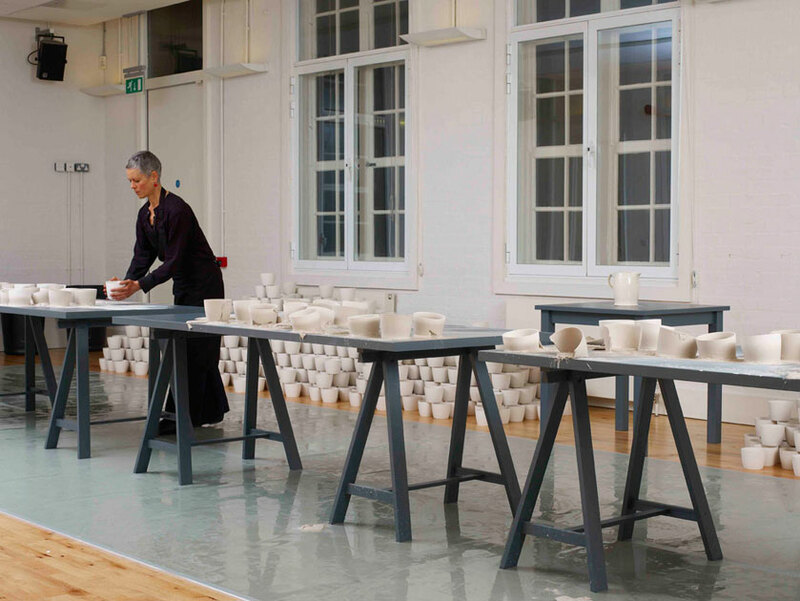 The ongoing development of these working practices is part of Siobhan Davies’ artistic approach. The Score for ROTOR is the abstraction of a choreographic form or idea, filmed from above to convey its structure, on the simplest level, to other artists. The choreography engages four dancers in a circular rotation, which suddenly breaks into linear pathways derived from the various forms of a knot. In this graphic, abstracted image the dancers seem like atoms moving at their own wayward and varying paces, although they frequently re-enter the circular system, where the rotation continues like a dial or a clock. “I am interested in paring something down to its vital components,” says Siobhan Davies, “and seeing if with a generous exchange it can generate or lead to other things.” In her new live work for ROTOR, Siobhan Davies has developed the choreography of The Score into the layered and complex design of A Series of Appointments, working with the tension created by the difference between the aerial view/pattern filmed for The Score and the ground level interaction between the dancers. 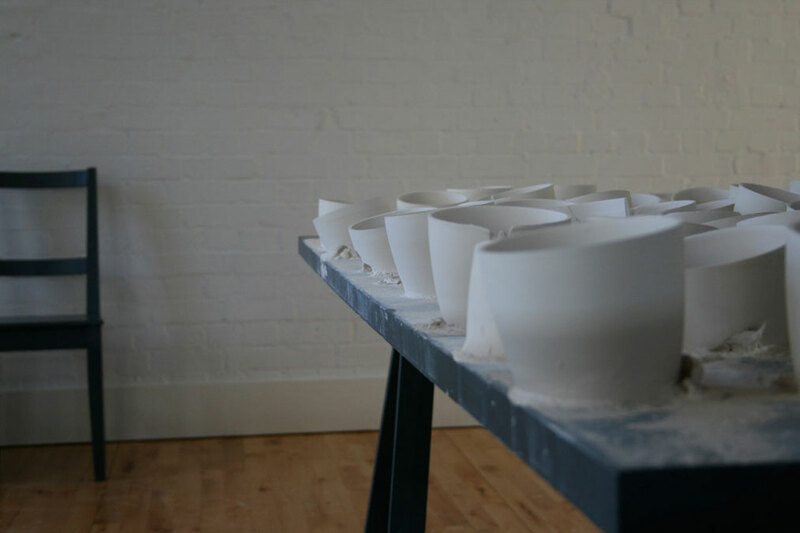 The nine other artists have responded in various ways to the combined elements of this work, responding to the design of The Score as well as being influenced by coming in to the studio to watch rehearsals. Composer Matteo Fargion’s Songbook is a musical and choreographic score written in three staves for Words, Sounds and Movements. It evolves in a series of phrases and progressions to a strict mathematical framework: 33 pages of 33 seconds each, three staves to a page, each containing three lines of 11 boxes, each one a second long. The instructions for movement are written as nouns or as a pattern of lines or hieroglyphs. The sound may be a musical note or a whistle or bird song. “I perceive it as music,” says Fargion, but there is also “an attempt to make each element equal, so that word, sound and movement have the same weight.” The score is written as a solo part but is performed here by the dancers as a quartet. All four performers negotiate it in their own time, aware of the others but in most cases performing independently. So there is extreme variety and vitality, unexpected texture and humour held within the pulse of the systematic framework. Playwright E V Crowe enters entirely different imaginative territory, presenting a fractured interplay of voices in Live Feed as the dancers perform their task of walking in rotation. Although these began as real reflections, drawn from the dancers thoughts and experiences in rehearsal, the script transforms them into formal ‘voices’, the performers proceeding in separate lanes in a shared existential situation. Crowe’s audio recording I’m Going to Show You extends this dramatic method into psychological territory, where a solitary voice teaches someone else to tie a knot with sustained, competitive tension, ratcheted up by the director Ramin Gray, as Crowe pursues the unfolding psychological game with a dramatist’s vision. In all these pieces, the skill of the dancers is paramount. They are intensely skilled interpreters and performers, not afraid to use all aspects of their bodies: voice, movement, pace and rhythm, memory, personal interaction; with a total commitment to learning, in this case, what is often a new language. They dance beautifully. They know how to create in and remember in the body all these various patterns, these systems. This is not formal movement, but their use of the body is trained, their expertise is open. 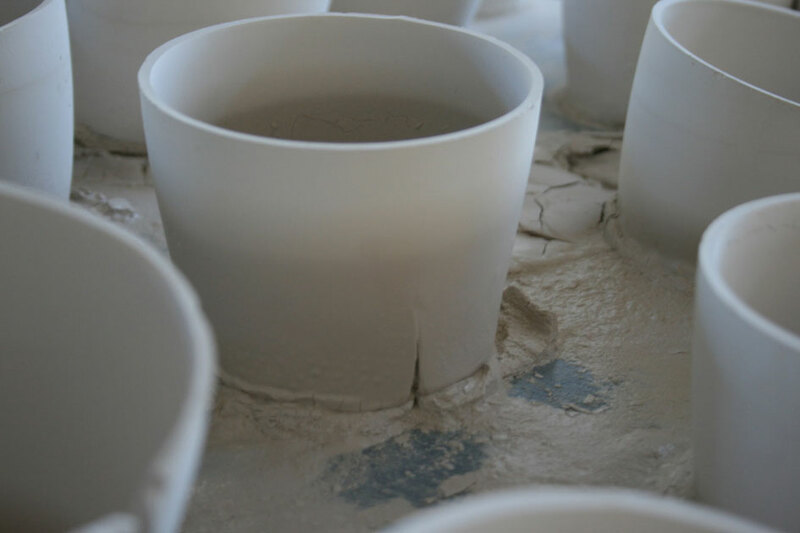 Working with a performer for the first time, ceramic artist Clare Twomey found that being invited into rehearsals allowed her to observe “the rawness of the making process” which is normally hidden in the finished work. The dancers’ attention to the precision of the form deepened her response to the abstract pattern of The Score, prompting her to emphasise their humanity in the making of the work. In Is it madness. 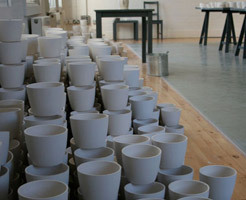 Is it beauty., Twomey designs an installation where a series of clay pots, unfired but expertly made, are filled with water until they break. 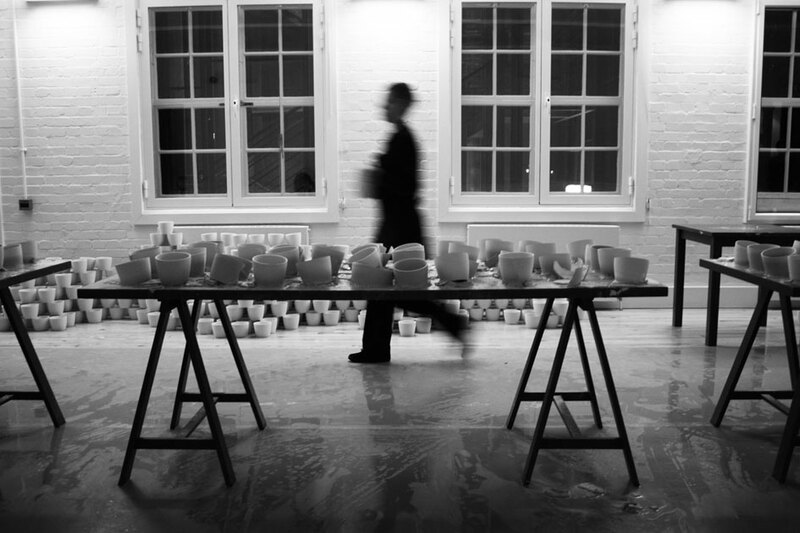 The pots are artisan but their forms connote beauty and ritual. Each is replaced and the task begins again, “without surprise; with hope”. 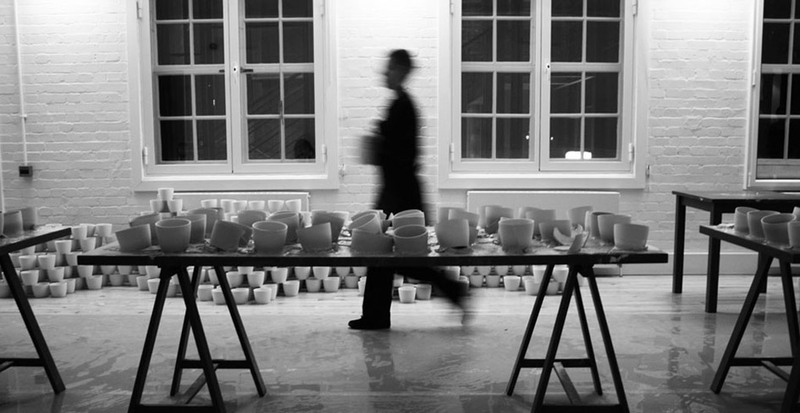 A long-term collaborator with Siobhan Davies, production designer Sam Collins is returning to his roots as a sculptor in ROTOR and working separately under her aegis for the first time. 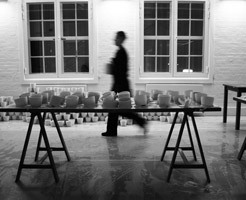 Now, rather than making a space for the performers to work in, it is a more controlled and private, though still a cinematic process. “I was always interested in a fractured narrative … a relationship between images,” he says, “[and] what happens if you throw a bit of randomness in.” Inspired by his changing view of the choreography as he moves around the rehearsal studio, Collins’ video installation, The Conversation Revolved, scatters ‘slices’ of images out to the walls of the room from a rotating central point. 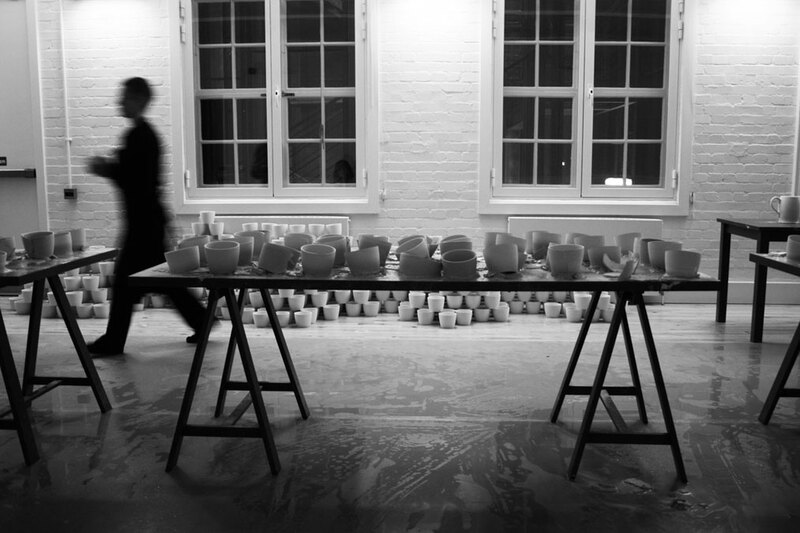 Engineer and artist Ben Tyers sees in dance the organically self-regulating energies of nature as a scientific system. The kinetic sculpture Vortice is built on mathematical principles, allowing him to explore a deeper and more intuitive model of engineering than the usual scientific models. This form too was drawn from his attendance at rehearsals, “watching the flow of movement and the energy lines”, while the freedom of working this way is allowing him to present his own ideas in development. “Nature … is always this balance and rhythmical interplay between opposites [which] always results in forward movement,” he says. Although it is a solid form, Tyers’ moving sculpture seems to be fluid, its spiral shapes continuously in the process of transformation. 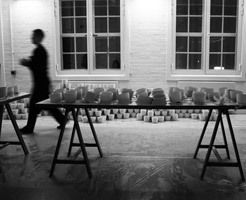 Elsewhere, in a site-specific installation combining architectural and live elements at the South London Gallery, artist Massimo Bartolini “contracts” the central element of The Score into a single moment of energy, as a dancer performs an hour-long rotation at sunset within a larger rotation of light around the walled garden of the gallery. 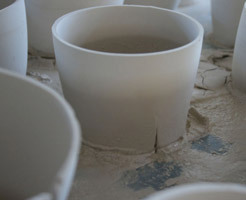 He speaks of his relationship to The Score as a matter of “empathy”, of shared interests. Cor is the heart of The Score, an abbreviation, but with an increase of gravity. Such compression also exists in the crushed paintings of Angela de la Cruz, whose painting Stuck is wedged into a window frame in the stairwell of Siobhan Davies Studios. Working in sympathy with “the anarchy” of The Score and the dynamic energy of the Studios, de la Cruz seeks to offset and contribute to this energy and this approach. “I was amazed by the anarchy of the movement. Everybody seemed to be trying to catch up and keep in line, which I liked a lot … because it looked to me as though everyone could do their own thing within an order given by the choreography. … My work has always been about anthropomorphic representation of human situations through the use of painting. … For Stuck, the idea was to make a painting bigger than the frame, that can’t go anywhere and won’t let anyone pass"
In recent years the term ‘the score’ has been used in visual art to describe the way in which an ephemeral work of art from the past can be reconstituted through its traces. This concept has been acknowledged as coming from music, as a way of pinpointing the design of a work, and directly referencing the paper score that can be read by a conductor or used by later performers. Now in Siobhan Davies’ choreographic project, the score is being used as a generative principle rather than a means of repetition, and as a starting point for new work, although it still holds the possibility of interpretation. 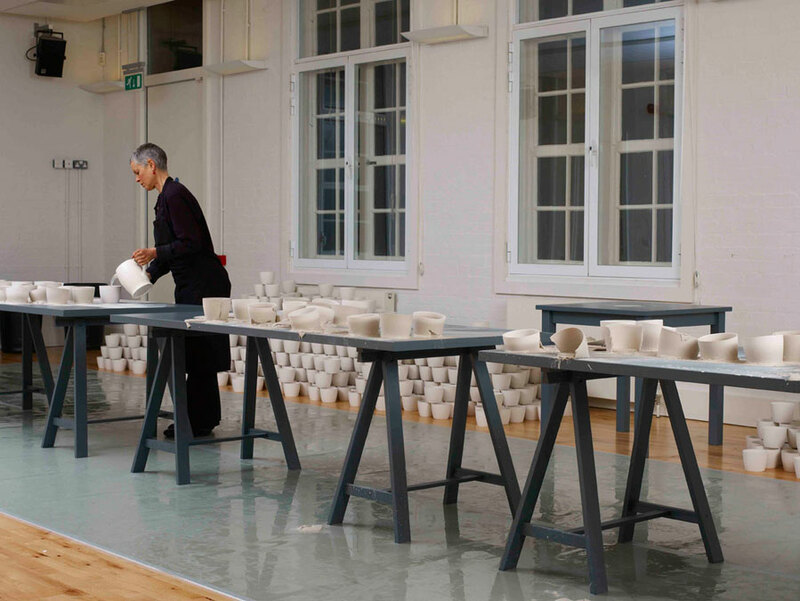 The “anarchy” of Siobhan Davies Studios and yet its profound order is reflected in myriad outcomes. Artists return to their roots and work in new ways. Sympathy is found in different materials and forms. The energy expands and is compressed; the polarity creates movement and is intrinsic to the organism.